The Gongchen Tank (“Heroic Tank”, 功臣號) refers to a specific Chi-Ha Shinhoto captured by the PLA (People’s Liberation Army) in 1945. The story is part of CCP (Chinese Communist Party) folklore and its fine details seem somewhat fantastical. 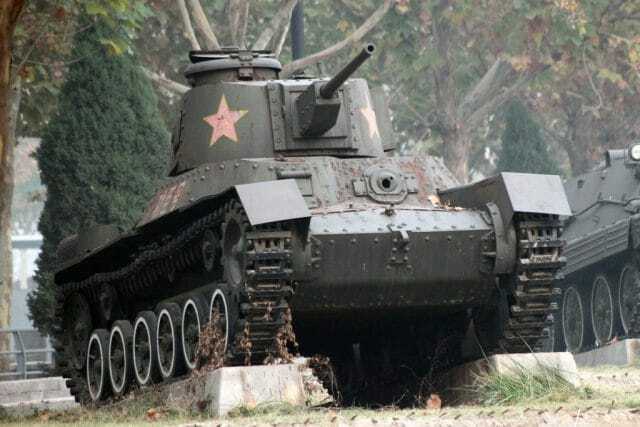 Nevertheless, the Gongchen Tank appears to have survived the Civil War and has been on display in a museum in Beijing since its retirement in 1959. 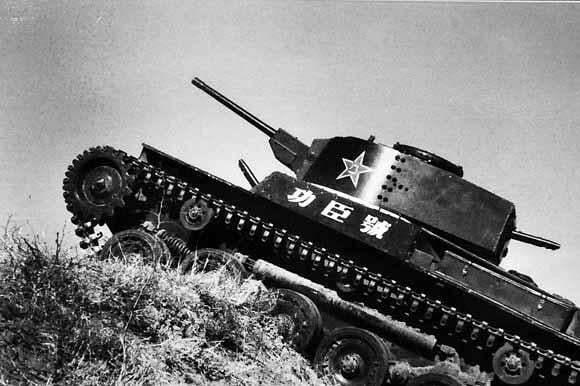 Large numbers of Chi-Ha and Chi-Ha Shinhoto (along with various other types of ex-Japanese tanks) were used extensively by the PLA, (and many were also used by the KMT – Kuomintang, the Chinese Nationalist Party). When the Japanese left China, following the end of WWII, they left behind their military equipment – the disarmament being left to the USSR. Fortunately for the PLA, the Soviets were sympathetic to them and armed the PLA with ex-Japanese weapons. 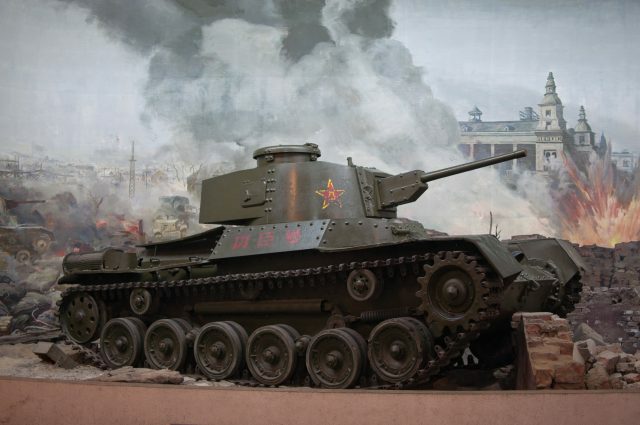 However, according to the story, the Gongchen Tank was captured without Soviet involvement. The Gongchen Tank on display in the main hall of the military museum in Beijing. The red writing does not appear to be faithful to the original scheme. The story of the Gongchen Tank is a little fantastical and textual evidence seems a little sketchy in some places. The story may have been significantly embellished by the CCP for propaganda purposes. To add to this, certain details of the story appear in one source, but not another. As a result, the story told here is a composite based on various texts and photographs. 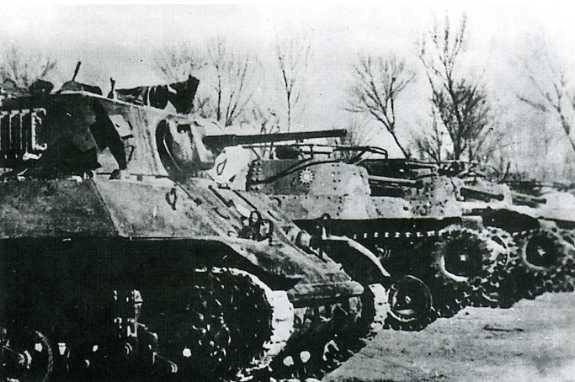 In 1945, the Communist forces in Shenyang (Liaoning Province, northeast China) discovered two Chi-Ha Shinhoto tanks which they designated “101” and “102”. 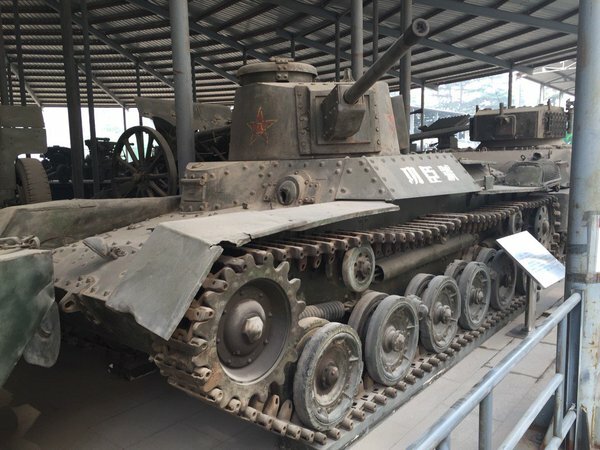 Confusingly, one source suggests that they had modifications to the turret and had their main guns replaced with 47 mm (1.85 in) guns, but this only appears to mean that they were Shinhoto models (also consider that the Gongchen Tank in the Beijing museum is a Shinhoto). 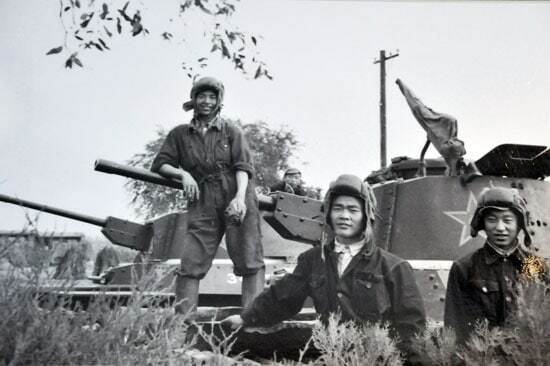 On December 1st, 1945, the Northeast Special Tank Brigade (東北特縱坦克大隊) was formed in Shenyang, with “102” (the only tank in the brigade) and thirty soldiers. The Communists then decided to retreat from the city, so the tank smashed through a KMT blockade and drove into the safety of a CCP-controlled area. Post-civil war propaganda photo of the Gongchen Tank. The Gongchen Tank’s first combat is reported to be in Suiyang County (now Suiyang Town) in Heilongjiang Province, northeast of Shenyang Province. The four tanks from Tonghua Artillery School were brought into Suiyang County via train. However, they were delivered too close to the battle, which meant that the train was shelled, creating a “sea of fire” (火海). Fortunately for the Communists, the tanks were not damaged from the fire. The source reports that the tanks went on to quickly kill 3000 KMT soldiers,2 no doubt an exaggeration. Any further details on the battle are lacking. In October 1948, “102” saw urban combat at the Battle of Jinzhou, in the Liaoning Province. Jinzhou was defended by 100,0002 (in fact, probably more) KMT soldiers led by General Fan Hanjie (范汉杰). The North China Tank Brigade had 15 tanks by this point. 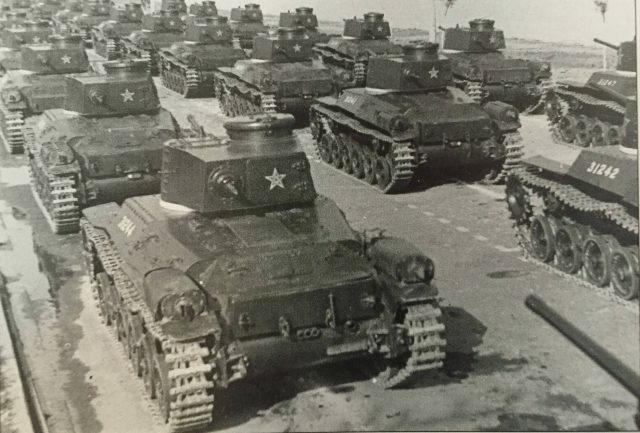 “102” had also become very respected, and earned itself the nickname “Old Man Tank” (老头坦克), a name which implies the vehicle to be dated but respectable, and still sturdy. Several tanks (of an unknown model) were damaged early on in the battle when crossing a river and were unable to continue fighting. The Gongchen Tank was finally retired in 1959. 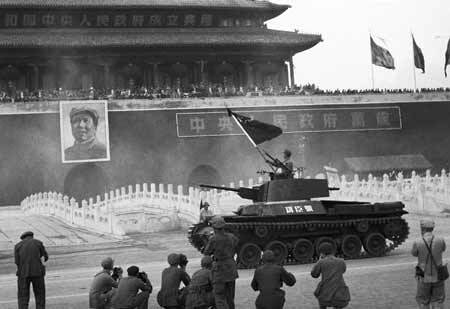 Gongchen Tank leading the victory parade in Tiananmen Square, 1st October 1949. The Chi-Ha and Chi-Ha Shinhoto were used extensively by the PLA. In fact, parade photos show that large numbers of the Chi-Ha, Chi-Ha Shinhoto, (and the Ha-Go, for that matter) were in service in 1949. One photograph even shows at least 35 Chi-Ha Shinhotos! Chi-Ha Shinhotos are reported to have received some modifications in PLA service, such as the replacement of the original engines with 500hp Kharkov V-2 engines. 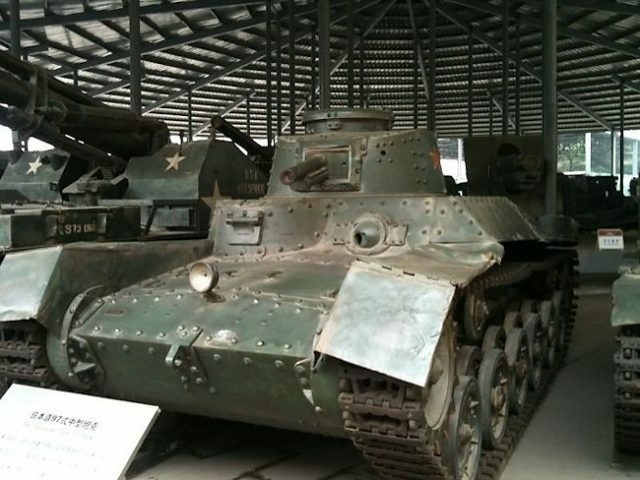 Unfortunately, tanks on display in museums in China have had their engines removed and it is difficult to verify this. 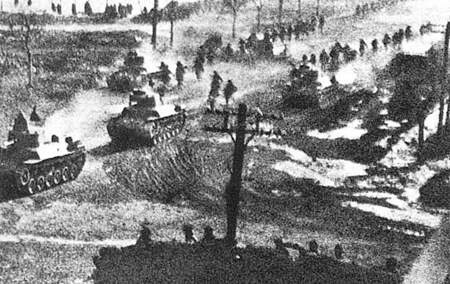 Their exact combat history is hard to judge without first-hand accounts, but one photograph shows regular Chi-Ha tanks advancing into Shenyang, Liaoning Province, in 1948. It could be the case that the majority of the PLA’s Japanese tanks were captured in and saw service in the northeast. Evidence is rather lacking on specific usage during the Civil War, aside from the Gongchen Tank’s story. Four (apparently regular) Chi-Ha tanks advancing into Shenyang, Liaoning Province, 1948. The exact numbers of Japanese tanks in PLA service are not available. Any Japanese vehicle left behind in China following their withdrawal could have been used by the PLA. It is estimated that the PLA used at least 100 Chi-Ha and Chi-Ha Shinhoto tanks. According to Dr. Martin Andrew, most Japanese tanks in PLA service were phased out following Soviet arms sales, 1950-1955. In May, 1946, the KMT is reported to have the following Japanese tanks in service: 67 Type 97 Chi-Ha Shinhoto, 71 Type 97 Chi-Ha, 117 Type 95 Ha-Go, and 55 Type 94 TK. It is possible that the KMT used any of the IJA’s AFVs that they could get their hands on. However, the USSR took control of Japanese disarmament, and most of the IJA’s equipment seems to have gone to the PLA. In any case, the KMT captured a large variety of Japanese tanks. A Kuomintang Chi-Ha Shinhoto. The white sun emblem appears to have been hastily painted over the original Japanese camouflage scheme. M3A3 (Stuart) and several Chi-Ha tanks in Kuomintang service. Undated, unlocated, possibly (according to an inference from the source) Northeast China, circa 8th February, 1946. The Gongchen Tank in its “October 1st” colors – as seen on the victory parade, October 1st, 1949. 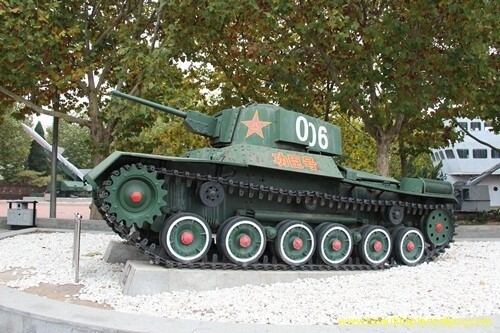 The Gongchen Tank in museum colors – a People’s Liberation Army Chi-Ha Shinhoto. Chinese Nationalist (Kuomintang) captured Chi-Ha Shinhoto. Apparently original Japanese colors with a KMT sun painted on top. 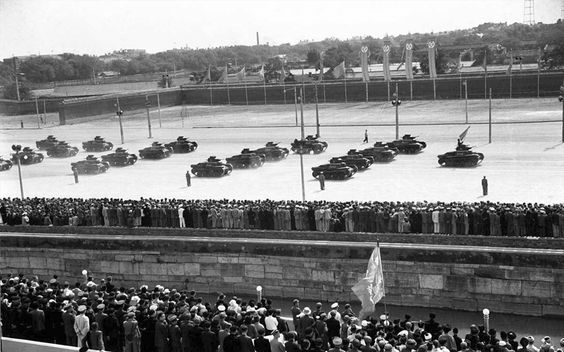 Photograph showing at least 35 Chi-Ha Shinhotos on parade, presumably 1st October 1949. These had white serial numbers, several PLA stars (one on either side of the turret, one on the rear), and a white band around the turret ring. Numbers that are clearly visible are: 31242 (right foreground), 31244 (left foreground), and 31247 (top right). PLA Chi-Ha Shinhoto “34458” and “34457” on parade in Tiananmen Square, 1st October 1949. 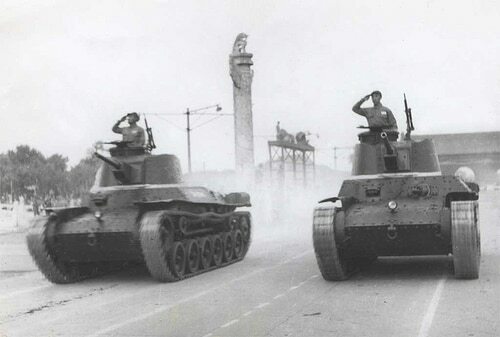 Pair of Chi-Ha Shinhoto tanks on parade, Tiananmen Square, 1st October 1949. 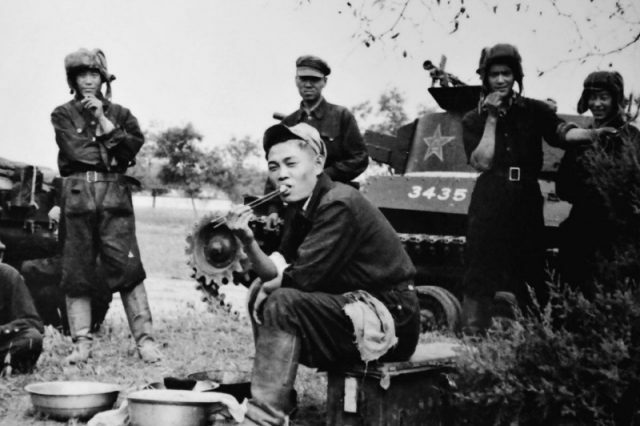 Chi-Ha Shinhoto “3435x”, with tank crews enjoying some downtime. Two PLA Chi-Ha Shinhotos and their crews, presumably during downtime. PLA Chi-Ha Shinhoto in a strange livery. The writing says “Heroic Tank”, but unlike the Gongchen Tank, this is written in Simplified Chinese, which means this is not an original camo scheme. The red and white roadwheels are also suspect. The number “006” is likely not original, as is the strange box added to the turret. The Gongchen Tank, as discernible by the writing on the side, outside in the Beijing museum. This paint scheme appears faithful to the original. The Gongchen Tank, on display in the open. A regular PLA Chi-Ha, on display at the Beijing museum. 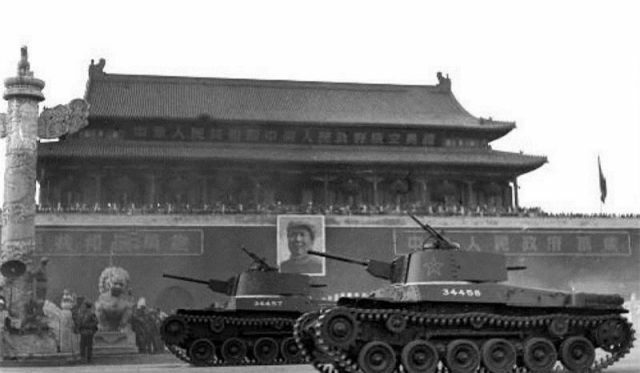 18 PLA Ha-Go tanks on parade in Tiananmen Square, 1st October 1949. Ha-Go “31414” of the PLA. 1 – According to an article from “Weapons Tactical Illustration Magazine” (兵器戰術圖解雜誌) July 2004. 2 – According to “Our Army’s First Tank” by Yin Guowang, article in “Knowledge of Weapons” (or Ordnance Knowledge – its official English title) (兵器知识) magazine, February 1996. The author would like to extend his thanks to Dr. Martin Andrew, and a translator (who wishes to remain anonymous) for helping with sources.